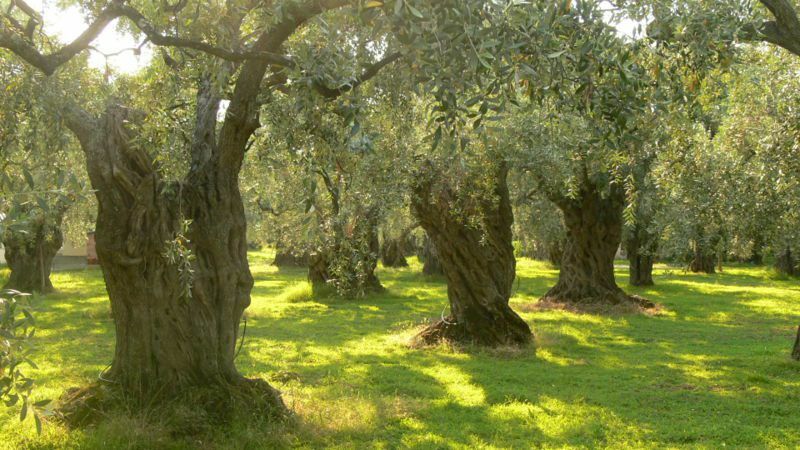 The olive tree is a Mediterranean tree, the praises of which were sung by all of the poets of Antiquity. A symbol of life and endurance, it is also an allegory for peace. It can grow to 15 to 20 metres in height and live for a very long time, sometimes 1,000 years or more. This tree (Olea europaea), from the Oleaceae family, does not have any one particular nickname. The olive tree has many branches, a gnarled trunk and cracked brown bark. Its leaves are evergreen in winter, opposed, oval, elongated, borne by a short petiole, tough, whole, turned towards the edges, shiny dark green on the upper face and a silvery light green with a prominent median vein on the lower face. Its springtime flowers, grouped into small clusters, are white with a calyx, two stamens, a corolla with four oval petals and a rounded ovary. Its fruit, olives, are first green and then become black when fully ripe. The wild olive tree existed in the Sahara, around 11,000 years before the common era and its domestication dates back to 3,000 to 4,000 years B.C. According to legend, a dove holding an olive branch in its beak appeared in the sky to announce the end of the Flood. This species comes from Southern Europe and the Near East. This tree requires a mild climate, sunlight and tolerates drought well. It suffers from over-watering. It can withstand cold temperatures up to -12°C when in a state of winter dormancy, but only up to -1°C when it flowers. Nevertheless, a marked winter is necessary to trigger the production of flowers and thereforeolives. The olive tree is a hardy tree, indifferent to soil type. For some years now, some of its varieties are grown north of the Loire, but the results are not as spectacular as those in the Mediterranean region. The wood of the olive tree, hard and grained, is used in cabinet-making. This species also produces delicious edible fruit oil that is particularly good for the health.